Hurray, it's giveaway day again over at Sew Mama Sew! I participated last fall and it was so much fun and gained so many fantastic new readers! Thanks y'all! Today, I want to give away a great book from one of the sweetest quilting bloggers I've met since I started this journey, Amy Smart. I participated in her Virtual Quilting Bee last year and then got to meet her at QuiltBLISS. I wish I wasn't such a chicken and tried to visit with her more, but my shyness over powered. ha! 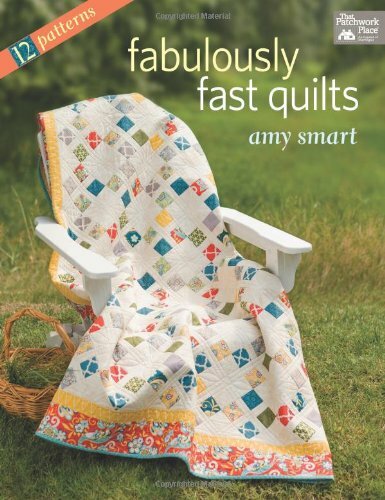 Amy recently released her first book with 12 fun, fast and easy patterns, Fabulously Fast Quilts. I already own the book and couldn't part with mine, and I want to support Amy, so I am giveaway a brand new copy today! Yay! To enter, please comment letting me know if you could met one quilter, who would it be? I am happy to ship internationally as long as Amazon and a copy of this book is available there. If you would prefer a Kindle copy, then I can send that anywhere! You don't need to follow my blog to enter, but I would love it if you did! It's really easy, just click my bloglovin button below! Want a copy of Amy's book now? You can find them here. I will pick a winner Friday morning! Giveaway Closed. Winner announced here! Oh my gosh, that's a tough question because there are so many to choose from ~ but the first two that come to mind are Christa Watson and Leah Day. BTW, I love your blog and have been following you for a while! I would probably say Lori Holt...her colors are just what I love. But there are SO many others! Thanks for the chance to win! I would like to meet YOU! Your quilts are beautiful! Thanks for the giveaway! I'm not really familiar with quilters as much as fabric designers...I think Anna Maria Horner would be lovely to meet! I think I'd like to meet Cath from Wombat quilts. I love her paper piecing. If I could meet one quilter it would be Camille Roskelley. I am a big fan. I would love a copy of this book. Thank you! Lori Holt,,,no Pat Sloan,,,Amy Smart,,,,,Cory Yoder,,,,,way to hard to choose, but I would be happy meeting any one of these talented ladies!! Thank you for such a lovely giveaway!! I would like to meet Denyse Schmidt. I'd live to meet Camille Roskellley. I love her style and she just seems like such a fun person. Thanks for the giveaway! That's a tricky question. My fear is that some folks might not be as awesome as I imagine them in my mind. However, I agree with you; Amy Smart was a delight to meet. Perhaps she will come to Quilt Bliss again, and you can have another chance. Speaking of that, Melissa's readers, Melissa is a pleasure to be around too, but don't let her fool you, she's not the shrinking violet she claims to be (perhaps just when star-struck). I found her to be true to her red-haired appearance--full of spirit and and an outgoing, talented quilter, who wouldn't shy away from bantering with a new friend or speaking her mind, but in a caring, honest way. To answer the question, I'd say Anna Marie Horner. I would want to meet Camille Roskelley! She seems like such a great person and I love her fabric collections! I would love to meet Leah Day. I'd love to meet Trudi Wood the amazing quilter, wait a minute, I already have! I would love to meet Lee @ Freshly Pieced. She seems so down to earth and I love her work! I would love to meet Jennifer Mathis of Ellison Lane. Maybe some day at Sew South? I'd like to go back in time, and sit around a fireplace with some talented ladies piecing and quilting pre- technology and electricity!! Would love to see those intricate antique quilts in the making. I would love to meet Angela Walters. i met angela walters a couple years ago. she amazes me. Oh man....I think I'd love to meet Lee at Freshly Pieced and Katie at Swim Bike Quilt, mainly because I think I'm obsessed with the Vintage Revival book. Your giveaway book looks awesome too. Thanks for the chance to win! Angela Walters was my quilt celebrity I'd like to meet, and I did, and she was amazing. Took some classes with her, and was so glad she was a great and funny teacher. Now I'd like to meet Elizabeth Hartmann, her blog was one of the first that I started reading years ago. I would love to meet Amy myself! I've been eyeing this book! I would like to meet Amy! I follow her blog. I would love to meet Leah Day or Angela Walter - I love their talent at FMQ. Thanks for the chance for the great book! I'm new to quilting but have found some of Leah Day's youtube videos very useful so I would say her. Hard! Cath Kidston, Camille Roskelley, cluck cluck sew... Someone to help me with free motion quilting. I follow you! I'd like to meet the scrappy lady...Bonnie Hunter! I would love to meet Angela Walters, she is such an amazing quilter. Hi Melissa....so happy to see you participating in Sew Mama Sew giveaways!! I was thrilled to meet Amy at QuiltBliss but my all time quilt hero and someone I would just die to meet is Alex Anderson. Thank you for the chance to win Amy's book. I would love to meet Kathleen Loomis. Oh there are so many wonderfully talented people out there I can't pick just one. But I too am a follower of Amy's blog! SO I would love this book lol! As a new quilter I would be completely star struck to meet any of these wonderful ladies! Lori Holt, Camille Rosekelley, Denyse Schmidt and Pat Sloan are a few that come to mind. Thank you for sharing! Do like following Kristy@ Quiet Play....love her vintage kitchen paper piecing! I would love to meet Camille Roskelley! Thanks for the chance. I'd like to meet Erica Jackman in person. Her quilts always speak to me. I think I'd love to meet Elizabeth Hartman. But I think I'd probably be too shy, like you! I would love to meet Diane Gaudynski and learn from her amazing machine quilting skills. Thanks for the giveaway! Laurraine from Patchwork Pottery. First quilter I ever really discovered and I love her work. I'm not big on meeting people I admire as it feels so intrusive but I really enjoy the down to earth attitude that Jenny Doan has and the fun videos she shares with all of us. Goodness. I am pretty new to this. I don't know any specific quilters but I would love to meet Heather Ross. I would like to meet Maddie at BAQS. Victoria Findlay Wolfe. She is so inspiring and friendly! I would like to meet Jennie Doan. I would like to meet Jenny Doan. Love her videos. Thanks for the great giveaway! Sarah Fielke - I would just love to watch her work! I think maybe Camille Roskelley or Lori Holt. Great question! I would like to meet Denyse Schmidt, I've been a fan for a long time. I'd love to spend time with Gwen Marston. I would love to spend time with Leah Day. She inspired me, and taught me most of what I know about quilting. I would really love to thank her! If I could meet on quilter it would be Jenny of Elefantz. I think the stuff she does is soooo lovely. I've met several but I would love to visit with Leah Day. Thanks. I would love to meet Kate Spain! Thanks for a lovely giveaway. I'd meet Melissa from Happy Quilting. I love her stuff and we have so much in common. Hard to pick just one, but I'll say Angela Walters. I would love to meet Anna Maria Horner. I love Natalia Bonner from Piece N' Quilt, she does amazing work! Christa Watson and Amanda Jean Nyberg! Jacquie Gering at Tall Grass Prairie Studio, Katie Pederson at Sew Katie Did, Angela Walters at Quilting is My Therapy and Judi Madson from Green Fairy Quilts. gorgeous book, thanks for the chance! I'm not sure I have an answer to your question though. There's certainly no "big blogger" that I want to meet, just the friends I've made through blogging who live far away from me. Several come to mind - Angela Walters, Elizabeth Hartman, Malka Dubrawsky, and Jacquie Gering. I would love to meet Jacquie Guerig. Her talk at QuiltCon last year was so down to earth and amazing! I would love to meet Denyse Schmidt, she is (kind of) the mother of modern quilting fabrics & designs but I love that she makes clear that the basis for all of this is traditional quilting & fabrics, that it's a question of re-invention & modern interpretation. Thanks for the chance to win a copy of Amy's book, she is one of my favourite bloggers. I would like to meet Leah Day. I would like to meet Amy Smart too since she taught me to quilt with her "making a quilt from start to finish" series on her blog! Been wanting this book! Thanks for hosting this giveaway! I like Denyse Schmidt. Thanks! I would love to meet Maureen Cracknell- I love everything she makes. I would love to meet Eleanor Burns. She is such a hoot! Amy because of her teaching and sewing skills, her personality and her energy. Lori because of her designs and organizational skills and of course, her little cottage which I just love. Alex because of her experience and her love of quilting. My grandma quilted, but I didn't while she was alive. I'd love to sit down to hand quilt something with her for the afternoon and just talk about whatever. Thanks for the chance! I would love to met Aneela Hoey or Tasha Noel. I love their fabrics. I would love to meet Bonnie Hunter , I am amazed at her scrappy quilts . Thanks for the chance . I'd love to meet Rita of Red Pepper Quilts fame, I'd love an insight into her creative space! If I could meet one quilter, it would have to be Angela Walters! She does some amazing work! I'd love to meet Anna Maria Horner -- I find her so inspiring! I think I'd like to meet Pat Sloan. She seems energetic and fun! Weeks Ringle - and her darling husband, if possible! - would be my pick - She is just perfect for me! I would love to meet Denyse Schmidt and win this prize. I would love to meet Heather Bailey. Pat Sloan since I read her blog daily. I'm a pretty new quilter, so I don't know about people very well, but I would love to meet the author of this book! I am following you on bloglovin'. hmmm, i'd like to meet kate spain as i love her fabrics. Wow - what a question! I guess I would like to visit with Pat Sloan. We could have a real good visit! Interesting question. I would pick Gwen Marston or Leah Day. Both have been very inspiring to me - they came into my life at the right time! I follow you on Blogloving. Thanks for putting my name in the hat for the drawing. I would meet my Aunt. She inspired me to quilt. Thanks for the giveaway. Leah Day. She has such creative energy and a giving spirit. I wouldn't know how to narrow the choices to just one quilter...... so many talented people. I would like to meet all the quilters whose blogs I follow! I would like to meet Eleanor Burns. She is such a happy, jolly person. Its kind of sappy, but I'd love to meet my great grandmother. With a lot less options and even less light, she made some amazingly beautiful quilts whose points all match. Bonnie Hunter. Great giveaway. Thanks so much for sharing. I met Denyse Schmidt last year so I would say Gwen Marston. I don't want to just meet her, I want to take a class with her. Thanks for participating in the Giveaway Day. I don't really know any quilters. Camille Roskelley! Love her books. Looks like I would love this one too! I'd like to meet Bonnie Hunter. She seems like a nice person, on top of being a great quilter and teacher. I don't know alot about quilting, but I want to learn! I would like to meet Tula Pink. I would like to meet Amanda Jean of Crazy Mom Quilts. Maybe Jenny Doan from Missouri Star. Her tutorials helped me get started and she's so funny! Thanks for the giveaway! I would love to meet and spend a day in her workshop - Cathy Geier, her work on picture quilts is amazing. She's also pretty lovely as she's a friend on Facebook and lets me ask lots of questions. Oh that is an easy one, sort of because there are actually 2 people that I'm hoping to meet and maybe even take a class from, both Judy Madsen and Angela Walters. I can only hope that I'm as good as them some day. And your Fire and Ice quilt is just stunning. At this time I would like to spend a day in the workshop of Maureen Cracknell. Her projects are very inspiring even for a beginner like me. I love Rita from RedPepperQuilts. I would like to figure out her secrets. Awesome giveaway - I've had my eye on this book for a WHILE! I'd love to meet my online friend, Marcia, and just watch her freestyle long arm quilting - and definitely learn from her. I know she's not "famous" - - - but her work is gorgeous and she's such a sweetheart! I think mine would have to be Bonnie Hunter. Her use of scraps is a total inspiration. Thanks for the chance! I would like to meet Kaffe Fassett. Wow - what a fabulous question! I would like to meet Roberta Horton and Nancy Crow! Denyse Schmidt and Lucie Summers! I think I'd like to meet Completely Cauchy or Jackie Gehring. They are both incredible artists with impeccable skills that also work at making a statement with their quilts. Hmmm, tough one. I think I would like to meet Jenny Doan or Leah Day (and many others lol). Amy Smart's book is on my list of books to pick up when I get a chance. Definitely Barbara Brackman for her contributions to the quilting world. Thanks for the giveaway! I think Bonnie Hunter, would be my first pick. I would like to meet one of the quilters from a few years back that have influenced me. Maybe Pauline Burbidge or Dierdre Amsden. Or the Japanese quilter with the Taupe and other books that have been recently translated: I think her name is Juko Saito. Apologies if I've mispelled or missed a name somehow. One of the gees bend ladies. I would like to meet Lori Holt! Thanks for the chance to win! I don't know enough "famous" faces to pick! I would love to just get to go to a quilt show sometime and meet all sorts of different creative minds! I would like to meet Kate Spain. I just love her. I have most of her quilting patterns and some her fabric. She is just a really talented quilter. I would be honored to win a copy of that book. It would become a wonderful addition to the beginning of my quilting library.Thank you for the chance to win and for being a part of Sew Mama Sew Giveaway. Oh, thanks for the chance! And I would love to meet Melissa Corry of Happy Quilting - I do her QALs a lot and she has so much energy! I would love to meet Amanda Jean from crazy mom quilts. I love all of her posts and her book. Maybe finally someone could show me how to FMQ!!!! I'd love to meet Elizabeth Hartman (Oh Fransson) - she's who really got me into quilting. I would love to meet Kate Spain or Amy Smart or Jenny Doan or Pat Sloan. I would love to meet Leah Day. I think she is such a great teacher. I would loveto meet Lori Holt. I'd love to meet Vanessa of V and Co. She cracks me up. I bet she'd be fun to visit with. I would like to meet Victoria Findlay. She seems like she is so fun. I would love to meet Amy Gibson! I love her work. I love Camille Roskelly. Her style is great! • • • I've been lucky enough to meet my favorite quilter and become friends with Tom Russell! Thank you for sharing! What a hard question.There are so many that I would love to meet but i think my first choice would be either Lisa Sipes or Eleanor Burns. Lisa's quilting is to die for and Eleanor invented the art of fast quilting. I would love to meet with Lori Holt of Bee In My Bonnet. I love her patterns and fabrics. Thanks for the chance to win! Thanks for the chance to win! I would love to meet Camille Roskelly. Thanks for the lovely giveaway. I'd like to meet Missouri Mel (Melissa). She has been the blogger/quilter that I have asked questions & I got to be in her fabric swap. I think I'd like to meet Gwen Marsdon or maybe spend time with the Gees Bend quilters - they have really inspired me. I'm new to quilting, so the quilter that I'm most familiar with is Leah Day. Thanks for the chance to win! I would love to meet Allison Harris of Cluck Cluck Sew. Elizabeth Hartman. Her Craftsy classes are amazing. Rachel from stitched in color. My first quilt was her color brick quilt along so it would only seem right. That's hard to choose, I think I'd like to meet Tula Pink, but she probably wouldn't agree on this, so Elizabeth Hartman. I think her designs are most impressive. Thanks for the chance! I would love to meet Denyse Schmidt. Id like to meet christa from christa quilts. I think I would choose Leah Day. I love her videos and they are always so helpful! The first one that comes to mind is Vanessa Christensen of V and Co.
Wow...Lori Holt for sure! & Victoria Findley!! I love Amy Smart and have been waiting to buy this book. I would love to meet Alex Anderson. I have been to a talk she put on and seen a few Quilt Show episodes, and she seems so nice and down to earth. I would love to meet Eleanor Burns. I have admired her for ages. I would love to meet anna marie horner. What a fun day that would be. I think I'd love to meet Camille from Bonnie and Camille. She seems so kind-hearted on top of being crazy talented! I think that I'd like to meet Rita from Red Pepper Quilts. I enjoy her blog and admire her work. I'd like to meet Leah Day. She does great FMQ and she seems so nice!